Over the weekend, the Democratic Party elected Tom Perez, a Latino civil rights attorney and former labor secretary under President Barack Obama, a man whose only successful campaign was as a county official 15 years ago, to lead the party out of its lowest position in 75 years. Democrats lost 64 house seats in the 2010 midterms and have gone downhill since, losing governor’s mansions, the majority of state assemblies and now the White House. While Perez’s leadership abilities have yet been tested, his political instincts are on point. After winning a close race for Democratic Party chairman, he chose his closest competitor, Keith Ellison (D-Minn.), an African-American Muslim and multiterm congressman, to become his deputy chair, a move that may be the smartest thing Democrats have done in the last two campaign cycles. It’s a huge boost for African Americans in the party. The Democratic Party is dependent on African-American voters to be successful—locally, nationally and even functionally. So it made sense that the elections for the next Democratic National Committee chair, the first in the post-Obama era, would take place in Atlanta, a city that has recently snatched the “Chocolate City” crown from Washington, D.C. Given the stakes at play, basically electing the leader of one of only two political parties that may run the United States, the DNC gathering was a rather low-key affair until the actual elections Saturday afternoon. The downtown Westin Hotel in Atlanta’s convention district was sparsely populated, and for most of the day, the energy wasn’t dissimilar to a Dunder Mifflin shareholder meeting. The hallways were covered in campaign signs for the various DNC positions—chair, vice chair and secretary—and campaign teams lured you to their tables with candy, flashy buttons and Democratic swag. Walking from table to table grabbing Snickers, T-shirts and pens made it seem more like the most expensive high school student council election ever rather than the selection of the leader of a multimillion-dollar political operation. By Saturday, election day, the temperature in the conference had jumped up considerably. Democratic luminaries showed up, including MSNBC host and former presidential candidate Al Sharpton, former Baltimore Mayor Stephanie Rawlings-Blake and actress Lynn Whitfield. There were even rumors that former Vice President Joe Biden was in the building. Prominent African-American political activists and leaders were working the room on behalf of either Ellison or Perez, although the question remained whether it would make a difference. Everyone in the room believed the election would be close, with Perez having the backing of “establishment” Democrats like Hillary Clinton and Barack Obama, and Ellison having the backing of the Bernie Sanders wing of the party. Although many in the Congressional Black Caucus backed Perez, there was a sense right before the vote that everyone had pretty good choices. Jaime Harrison, chair of the Democratic Party in South Carolina, dropped out of the DNC-chair race and endorsed Perez over Ellison. When I asked him why, he had praise for both leaders. According to California Rep. Maxine “Trump Doesn’t Want Any of This” Waters, either Ellison or Perez has the ability to lead the Democratic party out of the political wilderness. That kind of attitude, especially from African-American leadership in the party, seemed pretty well founded. Perez’s civil rights record on discrimination, housing and immigration as a Department of Justice attorney and labor secretary is impeccable. When a 2013 Breitbart article breathlessly begs GOP members of Congress to stop your confirmation, that’s a good sign. Ellison was re-elected multiple times in Minnesota and has strong ties to the African-American community, labor, millennials and the party’s new vibrant left. Ellison lost to Perez in a close 235-200 vote in the second round, and soon after, Perez created the position of deputy Democratic Party chair and appointed Ellison to the spot. Some Democrats, particularly African Americans on the left, are less than satisfied with this. It looks like the Democratic Party is sticking with the same old conventional leadership that relies heavily on black votes but refuses to elect substantive black party leadership. The DNC already has a vice chair position, so “deputy chair” may be superfluous. However, the party has enough work to go around, and there is more than enough for Perez and Ellison. 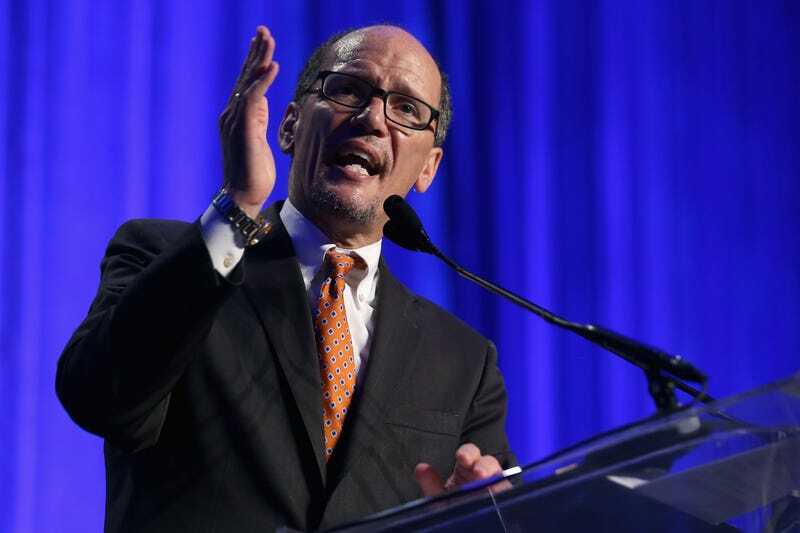 Perez knew that he needed not only to cut a deal with the Sanders wing of the party but also put to African Americans into at least a vocal leadership role in the Democratic Party. Ellison, for his part, will make sure his “deputy chair” position is more than ceremonial. It seems like the Democratic Party has finally realized that ot must unify ideas and wings of the party and not just rely on the hatred of Trump to bring voters together for Democratic policy. If only they had figured this out last fall, we might have a different president in the White House.